Whether they're in Beverly Hills or Pasadena, the Real Housewives of Beverly Hills stars always look flawless. 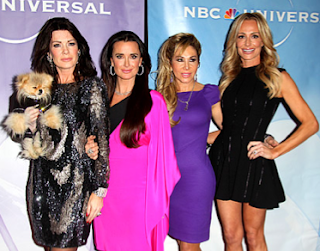 Lisa VanderPump, Kyle Richards, Adrienne Maloof and Taylor Armstrong made a stunning appearance at an NBC Universal press party on Thursday night. Missing from the four-pack? Controversial stars Camille Grammer (in New York meeting estranged husband Kelsey Grammer's fiance) and Kim Richards (likely home with her kids). Who's your favorite housewife?